In 1992 Larry had dubbed the event the “Black Rocks Arts Festival”. The name didn’t stick, with almost everyone calling the event “The Burning Man”. It wasn’t for a few more years that “The” was widely dropped from “Burning Man” when referring to the event. 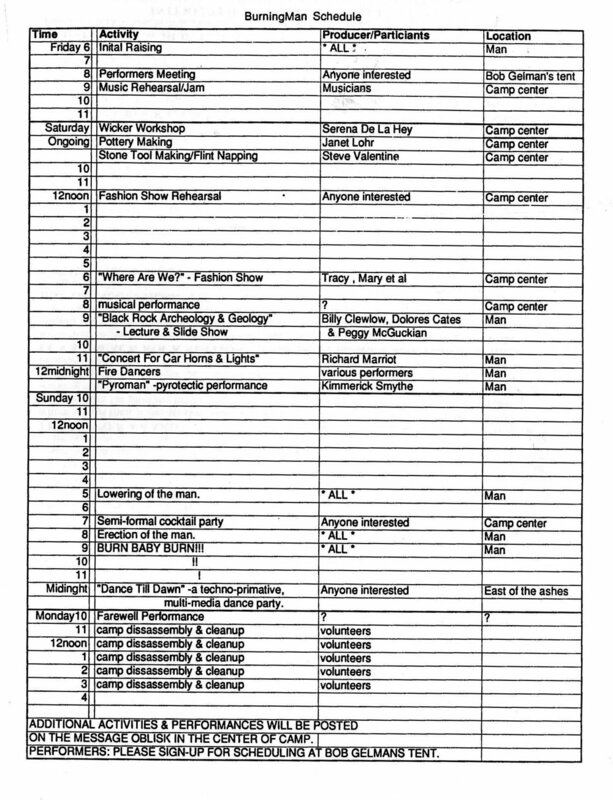 1992 was the year when some event organizers thought about the most basic civil amenities on the Playa. Michael Mikel formalized his role as chief “lost person rescuer” and along with Rob Schmidt, formed an eight-person band of “Rangers”. Mikel also published the first Black Rock Gazette, a single page, single edition release. There was a central message board, where one could place notes, and get updates. Among the messages one might find on the board in 1992 were occasional requests to buy or sell psychedelic mushrooms and other similar items. There was a semi-official volunteer medical staff of one, Dr. Jack McCloskey. The Burning Man gate was slightly more serious this year, and was operated out of a small silver trailer loaned for the purpose by Flash (which would soon become the “Burning Man Trauma Unit”). A small tag were attached to a car’s antenna to indicate admission had been paid. Some reports claim this was the only RV at Burning Man for several years. Not true, a lone Winnebago, was present as well for the first two years, before additional RVs appeared in 1992. Perhaps as something of a joke, the first DJs appeared on the Playa. The music encampment was positioned a mile away from center camp, and was not particularly well-received. The first DJ set had no participants other than the DJ himself, Terbo Ted, whi is still an active DJ and generally creative person. Burn.life has a wonderful interview with Craig Ellenwood a/k/a DJ Niles who brought the first DJ sets to Burning Man. So in 1992 I picked up a flyer from The Cacophony Society which was this underground org in San Francisco that did flash mob type things and weird art prank projects. At the bottom was a blurb about an event they were doing called Burning Man. I was part of an underground rave called Mr. Floppy’s Flophouse in Oakland and was a DJ and VJ. I thought what a cool thing to marry up with! A significantly longer video of Goa Gill, along Ariane McAvoy and B.R.A.D is found below. Kimric sends firecrackers to the heavens (with Rev. Al and Little Joe). By 1992, guns were more common, and fires were being complemented with explosions via home made gas bombs, and more sophisticated pyrotechnics. Kimric Smythe build a wall of fire with a long line of sawdust and kerosene, a flat plane of flames bursting abruptly from the ground. In later years he (and then he and his wife) would cover himself in fireworks, light them and dance around the base of the man in his persona as “The Exploding Man”. 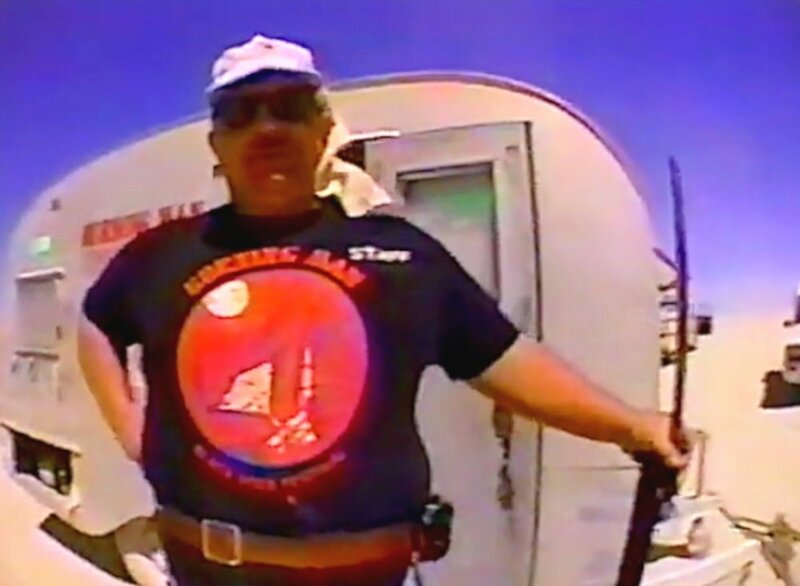 In 1992 the first artist not from the SF Cacopony scene arrived at Burning Man. Serena de la Hay came from England and made human-sized wickers on-site. She spent much of the summer living in one of the Cacophonist’s house (Nancy Phelps), working on them there as well. Desert House had initially been raised at the Desert Siteworks event that occurred in June over the summer solstice at Black Rock Springs. At Larry Harvey’s request, Binzen rebuilt it for Burning Man, and in 1992 it became an informal “center camp” gather place. Gregg Schlanger also had an installation of sorts: a two stall, hand pumped shower. He also installed a working flume in the Desert House by William Binzen. Jan Lohr, professional potter, and Larry Harvey’s ex-girlfriend taught a pottery class. Serena de la Hay, who had temporarily re-located to San Francisco to prepare her art for Burning Man, taught a wicker class. Steve Valentine taught a class on making stone tools. Billy Clewlow, who had discovered the largest mammoth in North America near Black Rock Desert, gave a talk on the Black Rock Archeology and geology, along with Dolores Cates and Peggy McGukian geologists from the Bureau of Land Management. Richard Marriott, then the senior composer for Atari, and founder of the Club Foot Orchestra, lead a Concert for Car Horns and Lights. David Thompson, along with James and Kris created a performance piece, Alien with WIckers. David, a photographer, was typically behind the lens capturing the event. Kymric Smith parleyed his job as the person responsible for the pyrotechnics used in the Man to become a bit of performance art himself. He attached a significant amount of fireworks and to cap Saturday night off, light himself on fire. He would repeat this performance for several years. The Burning Man Fashion Show made its debut, an annual event that continues today.